The new STEM building at Clark College in Vancouver. 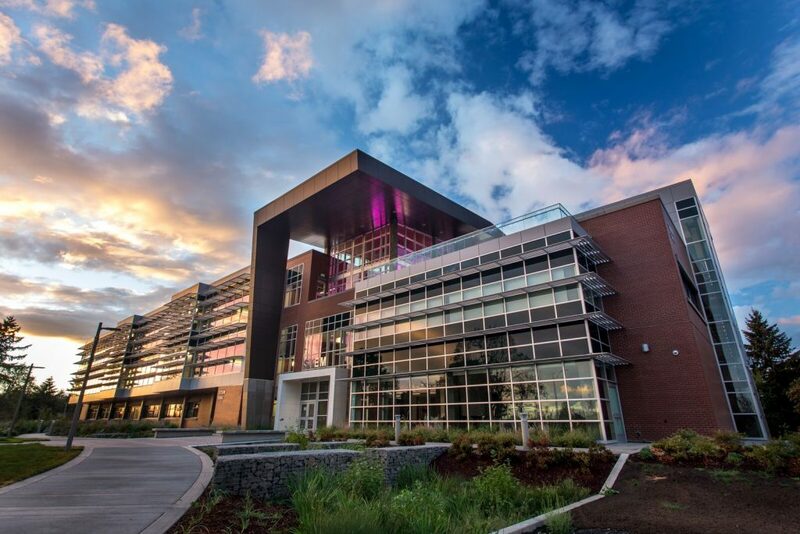 Last October, the ribbon was cut celebrating the official opening of Clark College’s 70,000 square foot, $40 million building devoted to educating students in the studies of Science, Technology, Engineering, and Math. It’s an exceptional building that I recently toured. In the next decade, an estimated 18,000 jobs in Southwest Washinton will require STEM-related education. Clark College is now training the future workforce, providing an affordable education that meets the needs of employers, and ultimately will assure a vibrant local economy. The construction of the $40 million dollar building was funded by the State of Washington, however, state budget cuts led to a 15% reduction in spending. 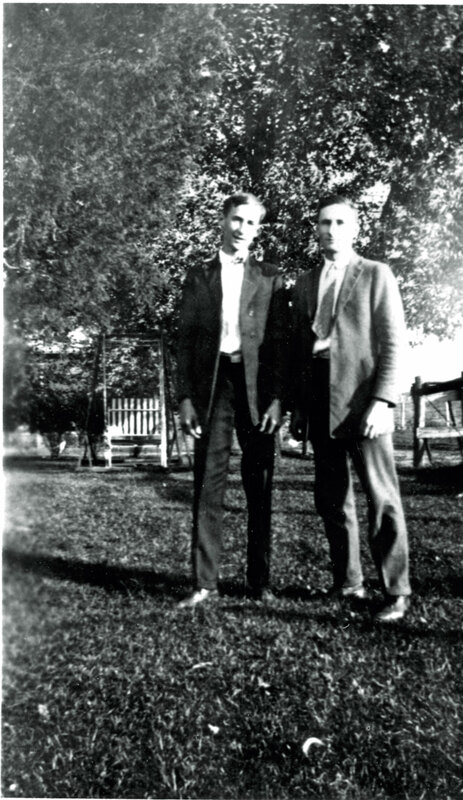 Philanthropic partners of the Clark College Foundation. along with members of the public, stepped up to contribute nearly $2 million dollars for classrooms and equipment. Starting in 2014, Cory Company has worked with the Clark College Foundation to develop TV and Radio messaging, digital advertising and media planning to supporting fundraising projects. Founded in 1933, Clark College’s main campus is located on 101 acres in downtown Vancouver. 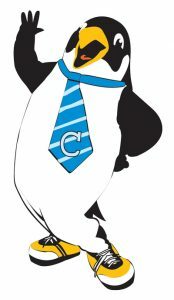 About 13,000 students are members of the Penguin Nation. (Oswald is the school mascot). The college also offers classes on the campus of Washington State University, Vancouver and at a satellite campus in east Vancouver at the Columbia Tech Center. Clark College has collaborated on partnerships with many regional colleges, universities, and technical institutions, allowing students to apply credits earned at Clark toward their bachelor’s degree. The August 21 Solar Eclipse: Schedule it! Mark your calendar and schedule your life appropriately for Monday, August 21. In about a month, Oregon will be invaded by “eclipse-chases” from around the world who travel to wherever the Moon’s shadow is going to touch the earth. Long ago, thousands of these space-loving people secured themselves carefully chosen spots to assure that they see this amazing sight. As predicted by the astronomers decades in advance, the moon shadow will travel a precise path across the United States, arriving with perfect accuracy. The marvelous dance of the cosmos is undeniable and completely out of our control. Also out of our control is the inevitably frustrating traffic we all face increasingly on a regular day around town. 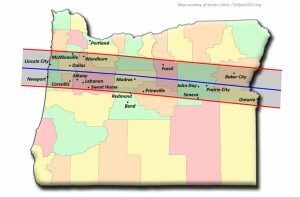 Factor in the multitude of astronomical globe-trotters, many of who will be landing at PDX and then traveling around the state and you can understand why the Oregon Department of Transportation predicts that the eclipse will cause the worst traffic jams in the Oregon’s history. ODOT is taking precautions, and you should too! Take a look at this path of the eclipse. The highways and by-ways in the center of our sweet state are expected to be full. As you can see, Portland is out of the path. You can head south to see a partial viewing. From Bend, head north. Or you can follow it online or through other media outlets. It’s not the same as being on earth when the magical black out occurs, but you’ll get the idea of the miraculous occurrence. It’s about a two-minute event, starting around 10 a.m.
You can get more information about the eclipse here, including a downloadable App. So, I don’t think we were supposed to take photos. But I couldn’t help myself. 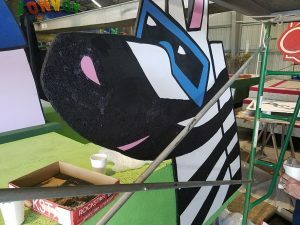 I wanted to sneak a few behind the scenes images at the huge east side warehouse where a couple dozen Rose Festival Grand Floral Parade floats are being decorated. While mostly assembled by professional builders, the volunteer crews come in during the final days before the parade to finish up the details. No simple task, that means covering every single piece of construction, with flowers, leaves, seeds and other natural elements, including wheat husks and shredded coconut, white and tinted. StudioFlowersPdx.com, is an exceptional floral designer also an active volunteer with The Bloom Project. Bloom is a local non-profit group that repurposes retail flowers each week that are then delivered to hospice patients around the city. 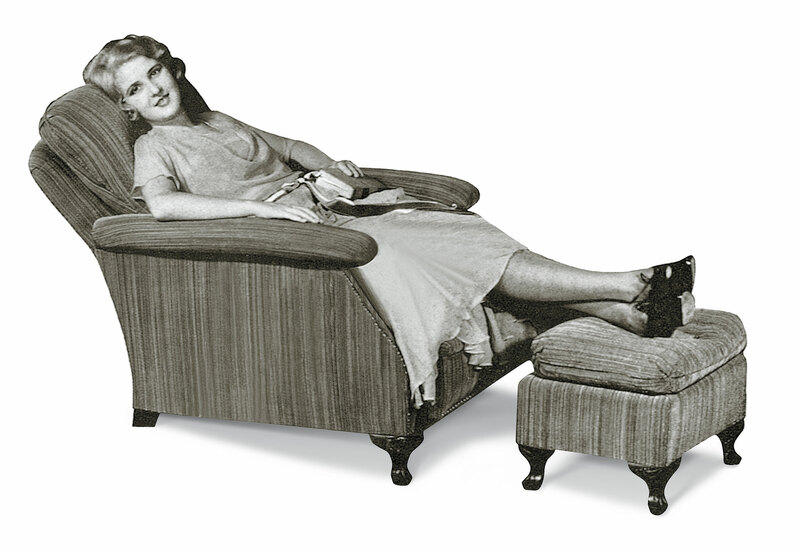 Ann was entrusted to create significant floral arrangements. With her exceptional skills, the float she worked on went on to earn a Rose Festivals Director’s Award. Others of us were supplied with sponges, brushes and glue, essentially “mod-podging” seeds on surfaces. A lesser but still important contribution! Happy to have had the experience, a small but necessary contribution to this wonderful, civic celebration.